Nathan Beckord is the CEO of Foundersuite, a venture-backed startup that makes the leading CRM and investor update tools for entrepreneurs who are raising capital. The turn of the calendar is cathartic for entrepreneurs — there’s something about starting a new year that inspires folks to launch a new startup, build a new product or raise capital. If you’re starting to raise capital, this is your guide. Let’s get to it. Fundraising is a numbers game, and unless you have Snapchat levels of growth or have previously taken two other companies public, you’re going to need to talk to a lot of investors. Thus, the first step is to build a list of 150-200 names to feed into the top of your funnel. Here’s why: A 5 percent “hit rate” — meaning the ratio of pitches to commitments — is pretty typical. Working backward from that metric, it means if you’re aiming to fill a seed round with 10 solid angels, you need 200 names on your initial list. Free tools to build your list include AngelList and Foundersuite, where you can search by industry and location; Crunchbase, where you can search similar (but non-competitive) companies and see who invested in them; and Quora, where you can search by keywords and phrases (e.g. 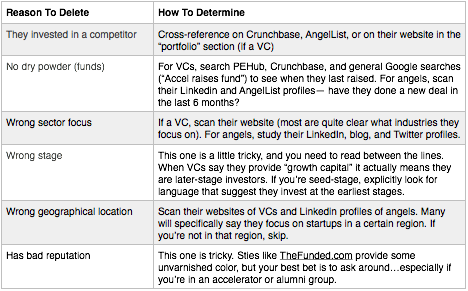 “Who are the top SaaS VCs/Angels?” and probably find an answer. Paid databases include PitchBook, Mattermark, CB Insights and others, which offer a variety of search and filtering tools. Other sources of leads include TechCrunch, PE Hub, Term Sheet, Inside Venture Capital and Venture Pulse, all of which are newsletters that report deals. Fundraising is a sales process, and as any good salesperson will tell you, you want to be selective in who you spend your time pursuing. This holds equally true (or more so) in fundraising. There’s nothing more frustrating than driving an hour and a half from San Francisco to Menlo Park only to find the “early-stage investor” you’re meeting with is looking for $200,000 MRR — or worse, they’re not currently doing new deals. You’ve just wasted half a day, which is an eternity in startup time. As a general rule of thumb, aim to cull around 25-30 percent of your original target list. Doing so will significantly improve your hit rate when you start the outreach process. In this step, your job is to figure out the best way to reach each qualified lead on your target list. The optimal way to get a warm introduction is via a mutual connection (and indeed, an intro by someone who has made money for the investor in the past is the very best). To map your contact path, simply plug the investor’s name into LinkedIn and see if you have any first- or second-degree connections. If you don’t have a mutual connection, a “hack” is to look at the portfolio of the investor and cold-email one or two of the founders. Build a rapport first — ask what the investor has been like to work with, their value add, etc. — then ask for the intro. As a very last resort, you can cold-email the investor. I’ve seen startups do this en masse, and it’s rare to get a response rate of more than 1 percent or so. Let’s recap: By now you’ve built a list, qualified that list and figured out your approach to each lead. Now it’s time to get organized for the actual raise. I strongly suggest setting up a tracking system to manage your raise. With a large funnel of leads to pursue, the complexity of keeping track of all the names, deal stages, conversations, follow-ups and to-do items will grow exponentially. Every investor meeting might generate 3-4 follow-up items to work on. Multiply that times the 100-150 investors on your list… you get the point. Get a system in place to manage your investor funnel and the hundreds of conversations you’ll soon be having. Many startups use Excel or Google Docs to keep track of their funding pipeline, though it tends to get messy and cluttered after about the first week. A newer trend is the “kanban board” method, where each investor is represented as a “card” that you can move through the deal stages — from New to Pitched to Due Diligence and Committed (or “Said No”). Foundersuite, Pipedrive and Trello are kanban boards popular with startup founders. Other founders repurpose their Salesforce or other sales-focused CRM tools for fundraising. Regardless of how you skin it, get a system in place to manage your investor funnel and the hundreds of conversations you’ll soon be having. In addition, you should have a 10-20 slide pitch deck, a 1-2 page executive summary and a financial forecast tight and ready to go. The pitch deck is the most important, as it is your “workhorse” during the deal; you will use it constantly. Here’s a guide to building a pitch deck if you need pointers, and here’s a collection of decks to get some inspiration. Before moving to Step 5, present for feedback your entire pitch at least five times to friends, advisors, your attorney and any “friendly” investors in your Rolodex. Collecting and incorporating feedback is a good habit to ingrain now; you will tweak your pitch materials constantly throughout your raise. With a qualified list and a tracking system in place, we are ready to start the money hunt in earnest. It’s time to start reaching out, talking to money folks and generating momentum for your deal. Subject: Jeff, can you make a couple of investor intros? Body: Jeff, I’m starting to raise money for my startup. I see you’re connected to <X,Y,Z> on LinkedIn. Do you know them well enough to make a lightweight connection? Body: Jeff, I’m raising a <$1M> seed round for Acme. We make <analytics and payment software for commercial drones>. We have <69 paid commercial accounts> and our revenue is growing <28%> month-over-month. I’d like to chat with <Aydin>: his approach and portfolio is really relevant <e.g. Flexport>. Three sections describing what you do plus a key, exciting metric or other “teaser” and a brief reason why you specifically want to talk to that investor is all you need. Now all Jeff has to do is click Forward and ask the investor if he wants to be connected (the “opt in” approach). In this way, you’re making it easy for Jeff; it takes very little time and he doesn’t need to spend valuable social capital. Making it this easy for your connectors to do their job is extremely important, as there is a direct correlation between how busy someone is and how connected they are. Repeat this process for all investors on your target list. If you’ve done your homework, and made a reasonably good match with what the investor is looking for and what your startup is pitching, your dance card will soon be full of investor meetings. Now your fundraise is in full swing. Your job is to generate momentum, and the best way to generate momentum is to have a lot of meetings. Every day. Every week. Until you’re funded. Investors can sense when you’ve got some heat on your deal, and it also gives you an air of confidence, which adds to the allure. Conversely, if your fundraise is dragging out and not really catching fire — investors can detect this as well. The format of these meetings will vary — coffee versus in-office versus Skype, etc. Most tend to be scheduled for 30 minutes to an hour. At the initial hello, be sure to reference the mutual connection and how you know him or her if the bond is strong. Each pitch will have its own unique flow, but try to guide the discussion as best you can to cover key points. After a minute or two of small talk, it’s time to get into the pitch. I like to ask the investor what format she prefers, e.g. “How do you like to do these? Do you want to go through the deck, or do a product demo, or just chat a bit?” Involve them in the process. If you’re doing a call, be sure to have a screen-sharing system set up and ready — you don’t want to chew up 10 minutes downloading and updating your Webex software (this happens frequently). Each pitch will have its own unique flow, but try to guide the discussion as best you can to cover key points. I also suggest you make the investor pitch you — ask how they tend to add value to their companies (general “value add”), as well as how they could help your specific startup, should you end up working together. After about 20 meetings, you should have a pretty good feel for whether your round is going to come together quickly (i.e. 2 months) or be a drawn-out slog (3-6 months); most tend to be the latter. That’s normal. Hopefully your meetings are leading to progressively deeper dives on the part of the investors. This means they’re interested, and if they’re interested, the discussion should start to veer toward valuation and terms. Next, you will receive a term sheet (if it’s a priced round) or commitments if you’re raising a convertible note. But even if you don’t have a term sheet after 15-20 meetings, don’t despair. Fundraising is a numbers game — remember our “hit rate” from Step 1? If you’re averaging a 5-10 percent ratio of pitches to commitments, you’re doing OK. This also means you’re getting rejected 90-95 percent of the time. Accept it as the way the game works, and don’t give up prematurely. Weak founders give up too soon. Smart founders know when to quit. As a general rule of thumb, if you’ve talked to at least 50 investors and if you’re still not getting any meaningful interest, it may be time to regroup and try later when you have more traction. Otherwise, follow up frequently with everyone who’s still in your pipeline. Send regular updates on your progress and new developments. Your goal is to get them to decide one way or another — if it’s a no, so be it — at least you can remove them from your deal pipeline. But with a little luck and perseverance, your pitch will start to click. Once you get the first term sheet, use it as a catalyst and push the other funds (or angels) to put one down too. When you get a verbal yes, employ Paul Graham’s handshake deal protocol. The more commitments and/or terms sheets you get, the more leverage you have and the faster you can move the round to a close. That’s it. Enjoy the “post-close glow” — raise a celebratory glass with your team and all the connectors who helped along the way — and get back to work. Your next round is likely only 12-14 months away.